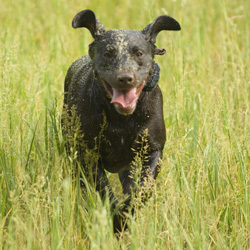 Truenorth Shady Sadie Sadie is 60 pounds of pure muscle, energy, and personality with a dark chocolate coat. In the house, she is quiet and neat. She prefers sleeping in my bed or lying on top of the back of the sofa where she can look out the window. Tummy rubs are heaven and she occasionally likes to climb into my lap for a snuggle. She’ll nuzzle, but never licks your face. Outside she likes to play and her favorite game is retrieving. She never heard a gun or retrieved a real bird until she was almost three. Two weeks later she was retrieving pheasants and ducks at 100+ yards and looked excitedly for birds whenever she heard a gun. Four months later she was retrieving moderately complex, 100+ yard doubles with solid marking and great style whether on land or water. Sadie has earned her AKC Junior Hunter (JH) title. I never really took her training to the next level only because I was focused on training other dogs that had started younger. 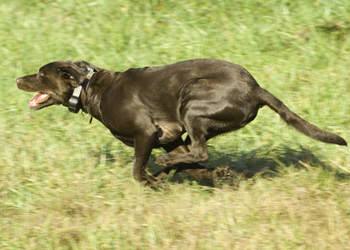 However, I have run Sadie repeatedly as a set up and test dog in field trial derbies. Sadie has been bred to FC AFC Barracuda Blue and to Rebel Ridge Williw Wonka Do It MH QAA and the pups from her litters are doing well as pets and hunting dogs. 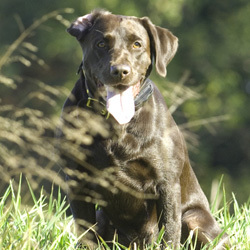 While they have not been competed, a number could do well as hunt test dogs. 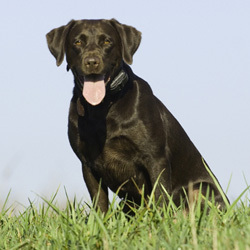 Maggie (shown at 7 months) is 60-65 pouinds and retrieved almost 300 birds while hunting in Georgia in her first season. Kona, from the same litter was hunting extensively and weighed about 80 pounds by the age of 16 months. Pups sired by Willie are super affectionate, highly trainable, and show good drive. Their weights tend to be a little more moderate, ranging from about 50-70 pounds. Sadie is now retired from breeding. and living happily at home.